L et’s start off by understanding that your company’s website may possibly be the first impression your business and brand gets to make on a potential customer. Your website is an incredibly important component of your online marketing so you want to put your best face forward. While that may seem like an understatement, there’s no shortage of poorly designed websites to make it worth saying again. What does your website say about you? Is it outdated, cluttered and unappealing? Or is it visually appealing, visitor friendly and has a professional presentation of your business? There’s no shortage of free website templates for you to choose from when considering a Do It Yourself website. Some are great, and some should never see the light of day. Chances are you’ll have to sort through a lot of the bad ones before you find a good one that you can make work for your brand and site goals. Most importantly, do your research; most DIY sites/templates have some restrictive limitations on their use. If you decide you did want to pay for a custom website design, there’s no shortage of great web designers and developers willing to do the work for you, if you don’t have the skills. Again here’s where you have to do your homework. There’s also no shortage of people out there that claim to be professionals whose work is cheap and looks worse than a bad DIY template. In most cases you get what you pay for. If budget constraints are holding you back from getting online and having a website, then this can be a good temporary solution. Do-it-yourself website-builder software costs you little or nothing, if you buy their hosting package. Again, check for restrictions. Free templates are ready-made, you can just drop your information in and launch it. There’s minimal backend work needed on your part. The sooner you get your site launched the more time you give yourself and your site to do so. New domains need time to earn a trust factor with search engines if at all. When you use a free template, you’re the designer. You can make changes any time of the day if you feel like it – you are in charge. Your website will look like a lot of other websites out there. Even if you plug in your logo, colour scheme and verbiage, it will still have a sort of generic look that will not communicate what makes your company unique. It will do little towards establishing your brand identity. These same designs are used by a great many people. Most free templates don’t hide the fact that they’re free templates very well. Unless you do some serious editing to create a custom header and footer, most people can tell. Many DIY companies place their own branding on your site template. Templates aren’t necessarily designed specifically for your business, so you may not be able to create your ideal site. Another thing that you may discover too late is that these DIY sites are not moveable. If you build your site within a particular hosting environment using their proprietary tools, you can’t export the site to another hosting. If you decide to move your site in the future, you will have to rebuild it from scratch. As your business grows, you want your website to grow with you. You may want to add content, pages, and functionality such as e-commerce. DIY sites have very limited capability and adaptability. And with many of these sites – something they don’t mention – you can’t switch design templates. Once you choose a design, you’re stuck with it. 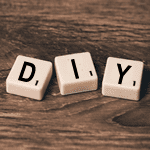 If you use one of these DIY sites, you’re pretty much on your own when it comes to SEO. SEO tools are limited or nonexistent. And some templates are even created in Flash, which is not SEO-friendly or easy to edit. Bottom line is that your DIY site getting listed on Google would be a hit or miss situation. As an aside, Flash is not supported by mobile devices, therefore that fancy slideshow or graphic presentation will not be visible on your iPad or iPhone. If you can live with these limitations, and you need to get a site up within a tight time frame and budget, then a “build your own website” service could be a solution. However if you want a website that uniquely presents your company image, has all the functionality you need, and is easily expanded and adapted to your growing business, then a custom site is probably the better choice. No need for compromise when developing a custom website. You can build it to look and feel however you want. You aren’t trying to fit a round peg into a square hole when you custom design your site. You are the only one with this design. Every aspect of the site is designed to reflect your brand and online goals. You can customize your site design to fit in with the rest of your Internet strategy. If you don’t know anything about web design and development, hiring a professional to do it for you lifts the burden off your shoulders so you can concentrate on other things like promoting and running your business. If the bottom line is your biggest concern, remember cheap can sometimes cost your business more in the long run if you haven’t done your research. Depending on how much functionality and bells and whistles you want on your site, the overall costs to build and maintain your site could escalate quickly. Even if you just want to make small changes. Be sure to thoroughly discuss changes with your designer. When you’re not the one handling the web design, you have to count on your designer or a 3rd party to make the needed changes. Developments or updates might not happen as quickly as you’d like. There are pros and cons to both free templates and custom designs. You have to decide what makes sense for your business and your budget. New businesses may want to stick with free templates until they have more wiggle room in their budget. Established brands might want to create a custom design to ensure their online and offline branding align properly. Whatever your reasons, just make sure you think it through before you go live! The plethora of DIY website building sites has some very enticing and visually spectacular layouts but it pays to read the fine print, in particular look for Terms and Conditions related to ownership of your domain name and 3rd party advertising on your site. This can become very messy down the road if you decide to change providers or wish to get the site developed further by a professional. Obviously the higher your level of technical skill the more you will be able to achieve on your own.